The Four Corners of Hell : A junction of four pubs in the Liberties | Come Here To Me! 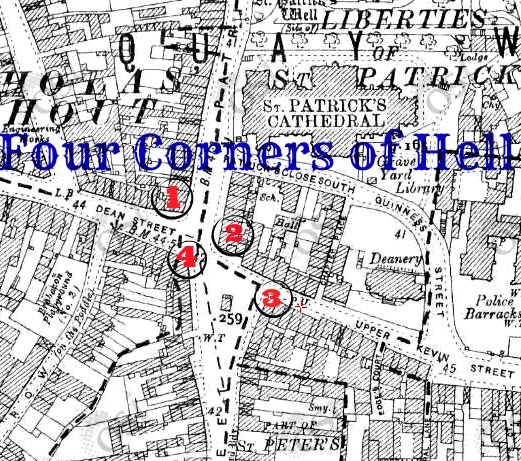 The Four Corners of Hell was the colloquial name given to the junction where New Street, Patrick’s Street, Kevin’s Street and Dean Street met in The Liberties, Dublin 8. In the shadow of St. Patrick’s Cathedral, this crossroads was infamous for having a public house on each corner and the immediate area after closing time was legendary for its rowdy crowds and punch ups. Revelers from rival neighborhoods or families would pour out onto the streets when the pubs shut and would settle old scores and new disputes with their fists. Famed local cop Lugs Brannigan and his men based out of nearby Kevin Street Garda station would often have their work cut for them. Its heyday was from the 1950s to the early 1980s. The cross-roads is almost unrecognisable today now due to the demolition and road widening that occurred in the 1980s. 1. Liam Kenny’s on the corner of 49 Patrick Street and 9 Dean Street. Status – Building demolished and currently the site of a 99c store. In the 1920s, the pub was run by a F. Martin and was known as Martin’s Corner. In February 1921, he was robbed at gunpoint by a man who made off with £10. Publican Joseph Cody took over the premises around 1950. He had previously ran a pub at 21 Braithwaite Street in the nearby inner city area of Pimlico. The Irish Times (12 January 1949) reported that two local men late one night the previous August had produced a pistol, forced themselves into the bar, asked for a dozen stout and whiskey and then shot and broke a bottle of wine and a mirror. Christopher Dunne (32) and Laurence Tierney (26), both of New Street, were found guilty of being in a possession of a firearm without a certificate. Dunne was sentenced to six months hard labour while Tierney was given a suspended sentence of nine months and bound to keep the peace for three years. The duo were found not guilty of possession of a firearm with intent to endanger life, conspiracy and armed robbery. [The aforementioned Christopher Dunne was father of career criminal Christy ‘Bronco’ Dunne Jr. who along with his brothers were chiefly responsible for flooding the city with heroin in the late 1970s and 1980s]. On 5 October 1949, landlord Cody was fined £12 for having opened his pub during prohibited hours on April 10th (Good Friday) last. Twelve men were found on the premises by police. On 3 January 1951, now based in Dean Street in the Four Corners of Hell, Cody was again fined (£1) for allowing two women to drink in his bar after closing time. On 21 November 1953, William Jackson (24) of Dowker’s Lane off Lower Clanbrassil Street was sentenced to nine months imprisonment for having stolen £7 from a cash box in Cody’s pub. Two others, Patrick Dandy (24) of Oliver Bond House and Thomas Claffey of Cashel Avenue, Crumlin were sentenced to 12 month’s imprisonment each. On 14 September 1954, Kilkenny-born John Kelly (40) with an address on Cork Street was sentenced for four months imprisonment for assaulting Joseph Cody. The publican was shoved down the stairs, kicked repeatedly and received two black eyes in the attack. … they were unable to make ends meet … (and) unable to pay a mortgage on the premises … They had not even a home now and were allowed by the purchaser of the premises to leave their furniture temporarily in them. As far as I can tell, Liam Kenny took over the premises in 1963 and it was known as Kenny’s thereafter. 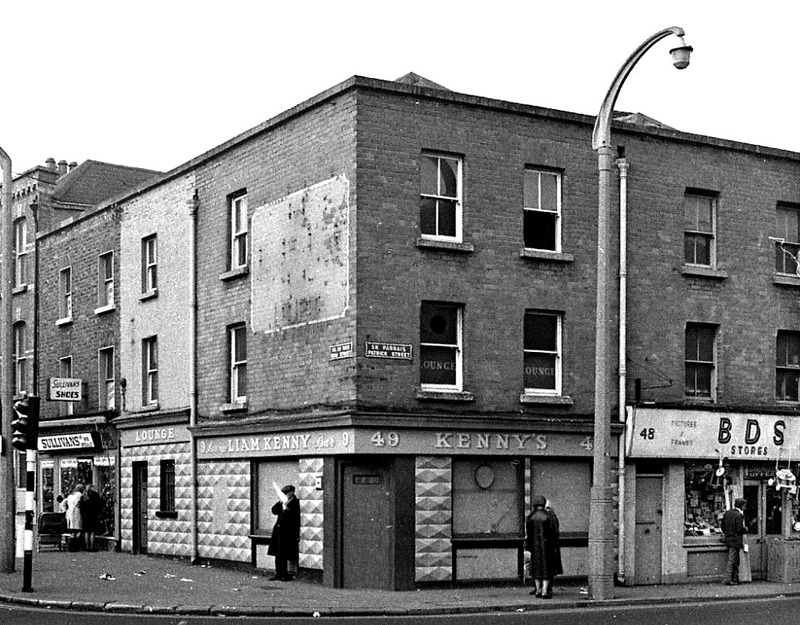 Liam Kenny’s, 1970. Credit – Dublin City Photographic Collection. In the mid 1980s, a large area of Patrick Street and Dean Street was taken over and demolished by the Council using compulsory order. 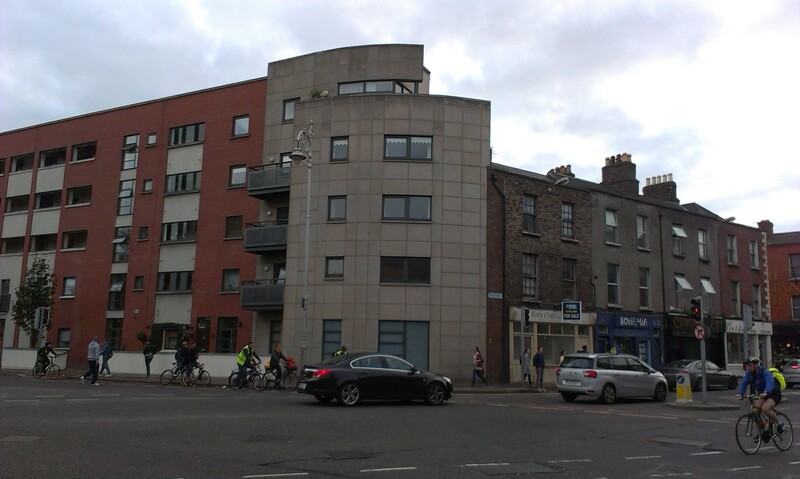 Patrick Street was to be widened and lands to the west of Patrick Street to be used for housing and development purposes. After years of stalled building work and planning objections, the seven-story apartment block ‘Dean Court’, comprised of 200 apartments in eight separate blocks, was put on the market in 1994. The shop front where Kenny’s once stood was a Chartbusters video rental shop and is currently a 99c discount newsagent. 2. Quinn’s on the corner of 50 Patrick Street and 31/31A Upper Kevin Street. Status – Demolished, replaced by pub (now closed) and apartments. 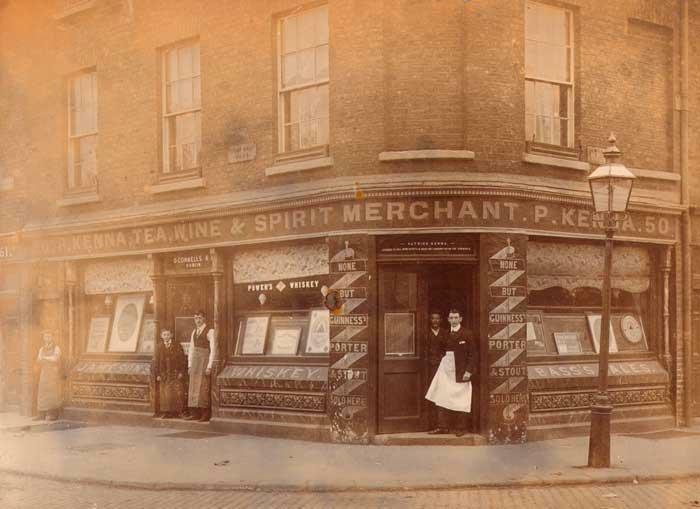 This pub was previously known as P. Kenna’s (see above), Kiernan’s (c. mid 1900s – 1920s), Cahill’s (1930s), Brannigan’s (mid 1940s) and Hamilton’s (late 1940s). 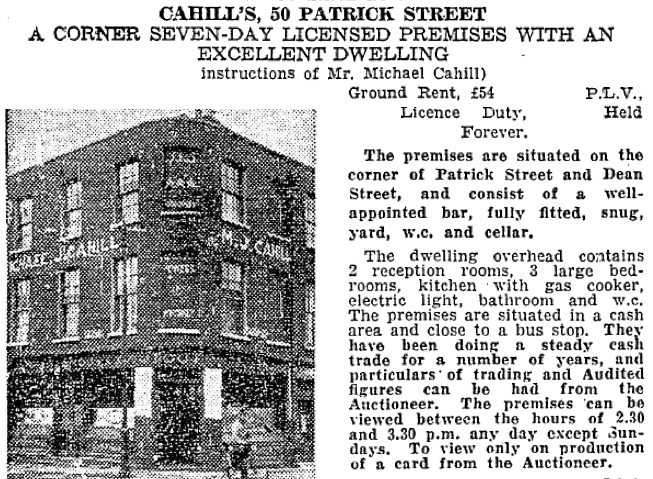 An advertisement for the sale of Cahill’s. Credit – Irish Independent – 28 April 1945. It was taken over by John Quinn and his brother James around 1950. In December 1952, Thomas Lane (21) from Oliver Bond House was charged with breaking into the pub, stealing liquor and then assaulting a Garda. He was sentenced to two months in jail. 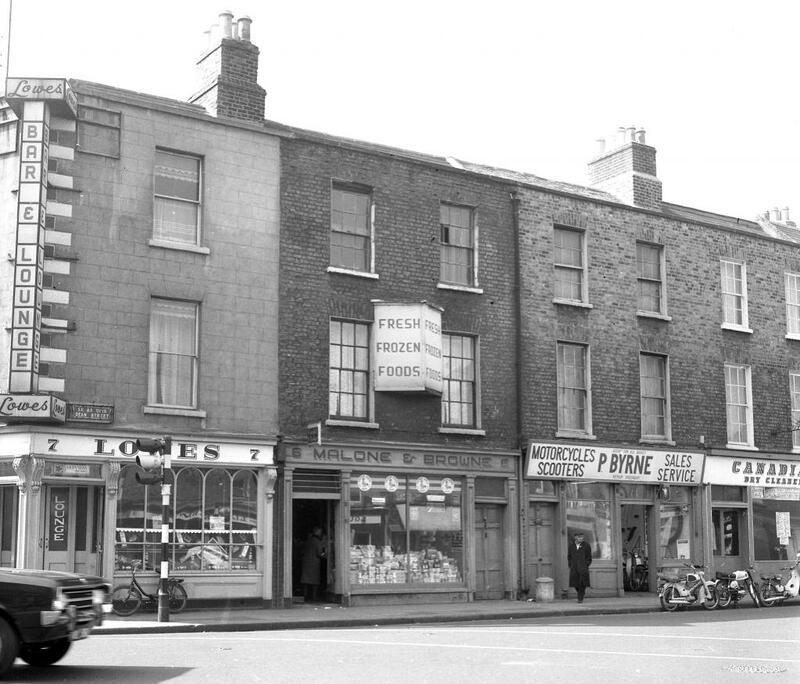 In the late 1950s, the Unemployed Protest Committee used 50 Patrick Street as the contact address for their organisation. It was reported in the Irish Press on 9 November 1960 that four young men were charged with assaulting publican John Quinn and his brother James on the night of 23 September. They also smashed a plate glass window. The four individuals, all from Crumlin, were William Travers (21), 306 Cashel Road; William Doran (22), 38 Durrow Road; William Kinselle (22), 39 Durrow Road and Henry Hickey (18), 27 Windmill Park. The trouble started when the men tried to bring their bottles and glasses downstairs from the lounge. When Quinn tried to stop them, he was set upon by the group. 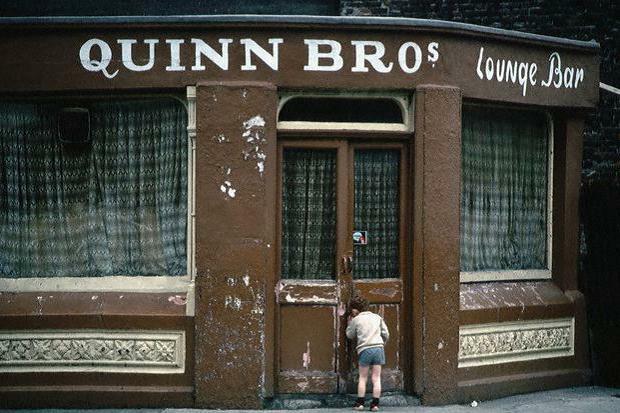 Quinns, 1976. Credit – Dublin City Photographic Collection. John Quinn passed away in April 1965. Quinns, c. early 1980s. Credit – @OldDublinTown. The pub was later known as TPs before finally being taken over by Patrick Nash. At some stage, the building was knocked down and a one-story Nash’s replaced it. I’ve heard from two reliable, separate sources that in ‘Dublin wit’ you could finish a relationship by telling your boy/girlfriend that “you’d meet them upstairs at Nash’s”. As the story goes, the jilted lover would turn up to the one-story pub and realise the game was up. The premises was demolished and replaced by a modern bar (retaining the name Nash’s) with apartments upstairs. Pat Stacey reviewing the pub in the Irish Independent (10 July 2001) described its decor as “simple and comforting – a mixture of stone walls and wood furniture”. The clientele was made up of “a bedrock of locals, drawn from the four corners of the junction … (and) a light sprinkling of passers-by and tourists”. This current reincarnation of Nash’s closed down a couple of years ago and the premises is still empty. 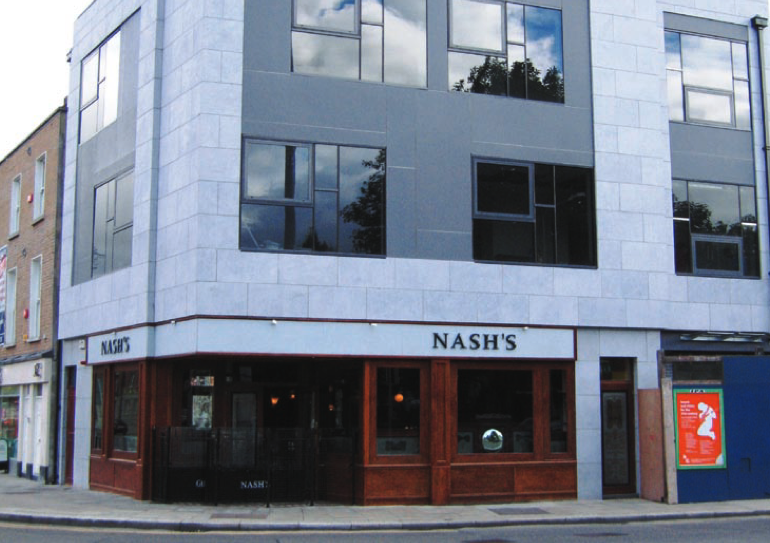 Nash’s, 2010. Credit – morrisseys.ie. 3. O’Beirne’s on the corner of 30 Upper Kevin Street and 1 New Street. Status – Demolished to make way for road widening. At the turn of the 20th century, the pub was owned by Alderman John Davin. From 1905 to 1935, it was known as the The Premier House and ran by Daniel Lynch. Following a brief period when it was under the direction of Christopher Casey, the pub was managed by Francis Moran from the late 1930s until 1947. Morans pub. Credit – Irish Independent, 8 March 1947. 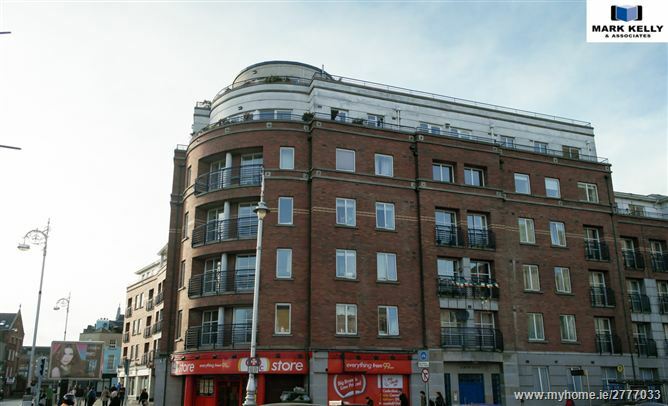 In 1947, Desmond ‘Dessie’ O’Beirne from Sandymount, Dublin 4 bought the premises for £8,000. 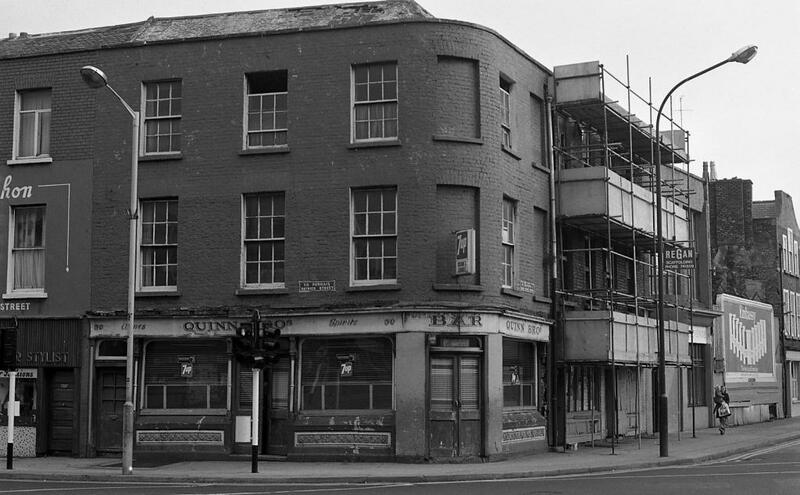 The pub was demolished circa 1980 along with many parts of Upper Kevin Street/New Street to make way for road widening and the new cross-roads. O’Beirnes. 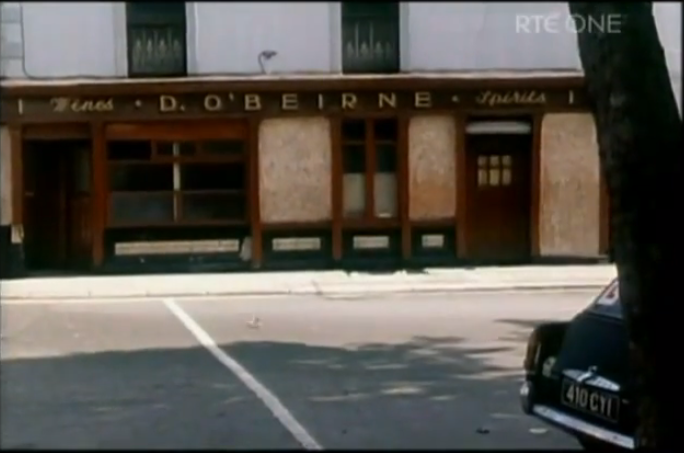 Screengrab from ‘Dublin: a Personal View’ (RTE, 1979). 4. Lowe’s at the corner of 7 Dean Street and 57-72 (?) New Street. Status – Demolished and replaced by apartments. Lowe’s, 1968. Credit – Dublin City Photographic Collection. 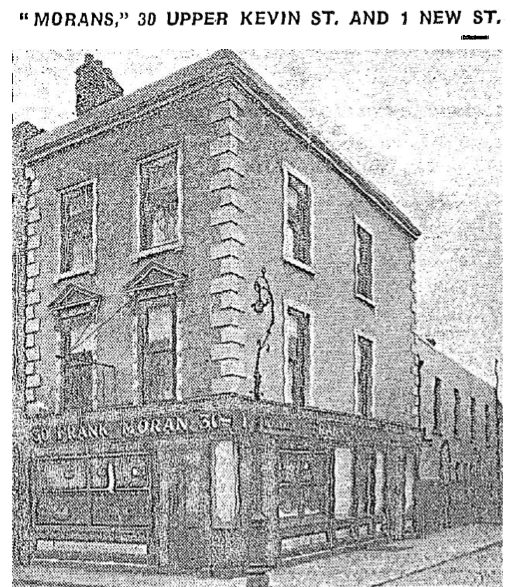 Previous owners of this pub included James Vaughan (1897 – 1917), James Madigan (1917-1923) and Joseph Dunne (1924 – 1955). It was taken over by William Lowe in the mid 1950s. 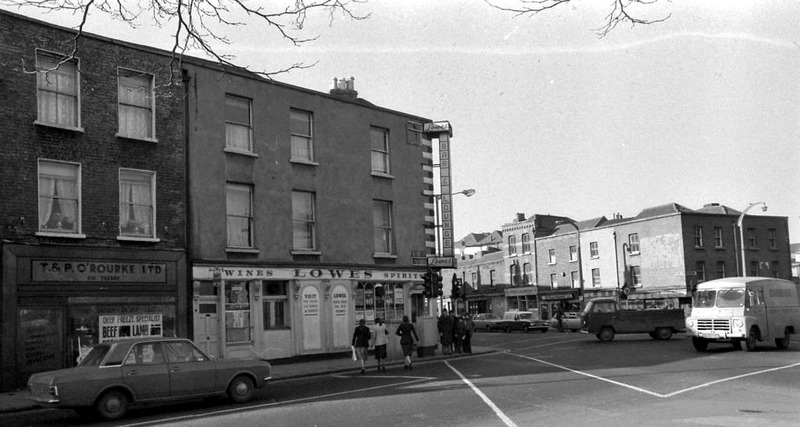 Lowes, 1976. Credit – Dublin City Photographic Collection. The pub closed in 1989. Lowe’s. 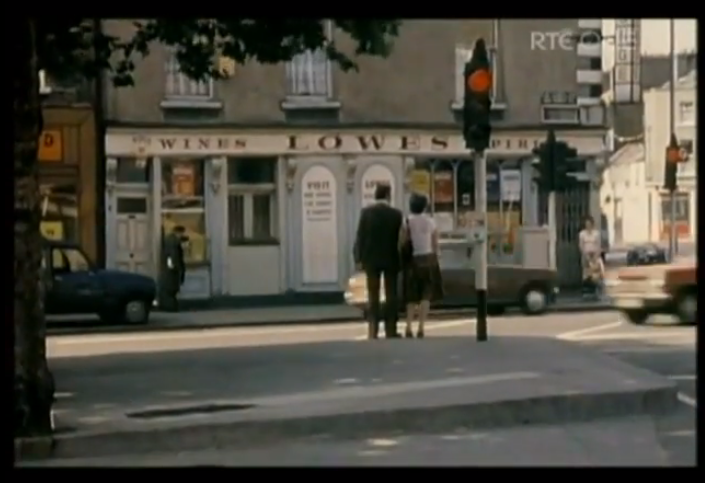 Screengrab from ‘Dublin: a Personal View’ (RTE, 1979). Patrick Street will soon become a major highway as soon as all the buildings opposite St. Patrick’s Cathedral are knocked down. The corner of Patrick Street, Kevin Street and New Street will be transformed into a major traffic interchange, although the gents’ toilets, surround by oak trees, is to be preserved because of it’s “outstanding civic design character”. But there’s doubts that it will look somewhat incongruous in its new surrounding. 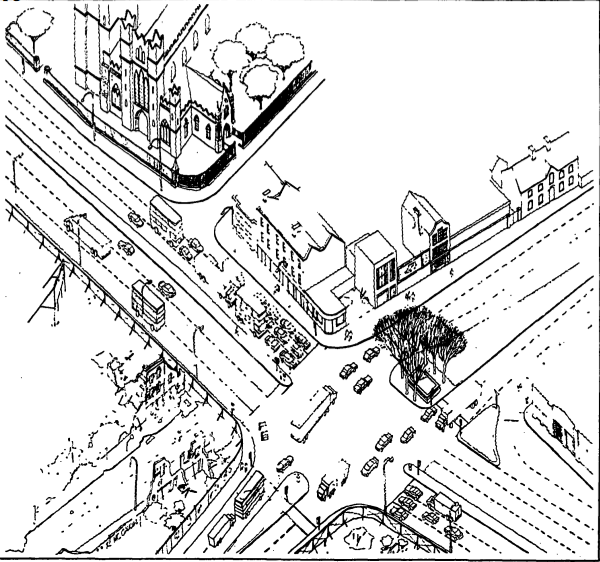 Architect Robert McCauley’s drawings for the cross-roads after Dublin Corporation’s major development plans. Credit – Irish Times (5 June 1986). …with the street left pock-marked for years by derelict sites, scrapyards and half-demolished buildings. But for the Iveagh Trust flats, St. Patrick’s Park and the cathedral, Patrick Street would have been lost. Three local pubs which have long served as neighbourhood centres will go, never to be replaced. New Street and Clanbrassil Street will lose a total of five pubs. While the Liberties is still a thriving, bustling and exciting neighborhood, the development of this particular cross-roads and the related destruction obviously had a huge negative impact on the area’s community spirit. 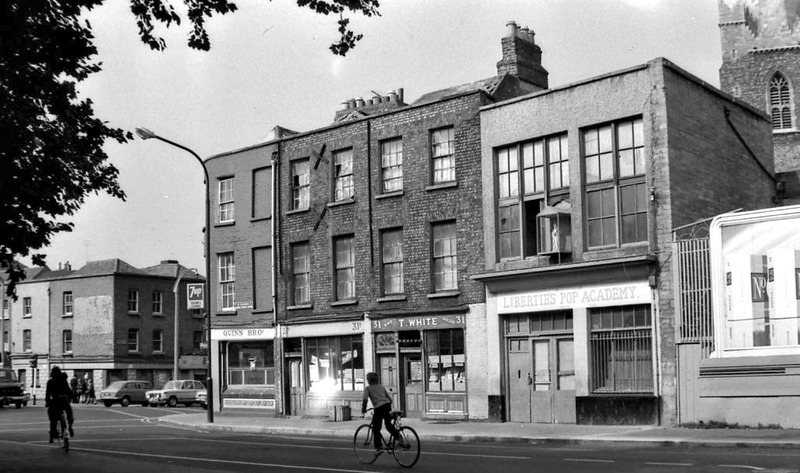 With four pubs demolished and a dual-carriageway cutting through one heart of the Liberties, the destruction turned a community intersection of pubs, shops and life into a soulless traffic junction. [Thanks to John Fisher, Seán Carabin and Brendan Martin for additional information]. Great post, the “Quinn Bros. c1960s” picture originally appeared in Discovering Britain And Ireland by the National Geographic Society (1985) so I suspect it actually dates from early 1980s. I believe ‘Hell’ was a semi-official name for a (presumably) un-salubrious lane or neighbourhood in the vicinity of Christchurch, long since redeveloped. Perhaps the name was relocated to this junction, or perhaps it was always ‘Hell’? Thanks for drawing my attention to that, I love the idea of the wooden devil! Do you think the old Hell and the more recent one were in the same geographical space, or just close enough for the name to slip from one to the other? Or is it just a coincidence? 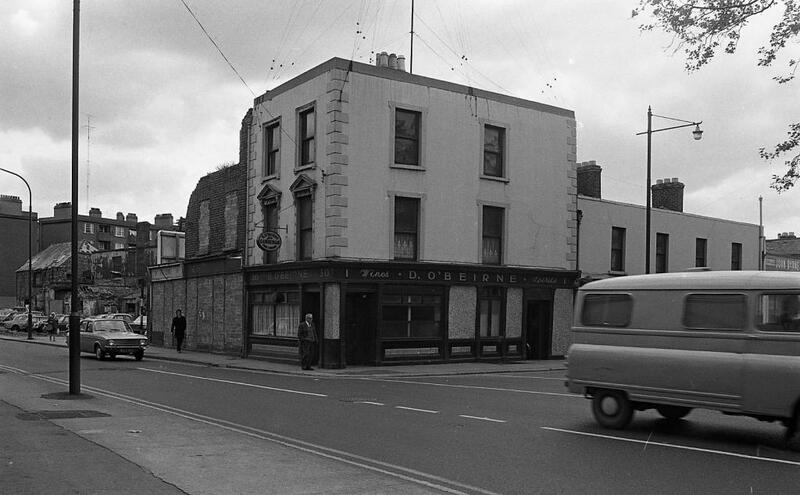 Was O’Beirnes namedthe New Inn later, home of Smiley Bolgers gigs including the original phibe for philo? nice work lads…incidentally the purchase order was also on the east side of the street and the corporation wanted to widen up to the cathedral..today there is the extra wide pavement at the west end of St. Patrick’s cathedral and I believe it was Dean Griffin and Charles Haughey who stopped them. Brilliant article, I’ve some good memories of this area, my grandmother’s house was a few door’s down from Lowe’s pub on News St.
As is almost evident in the picture there In the 80s it was surrounded by waste ground & the upper storeys of the building had been demolished but it was still a fully functioning boozer. The New Inn mentioned above was a little further up New Street from Lowes. 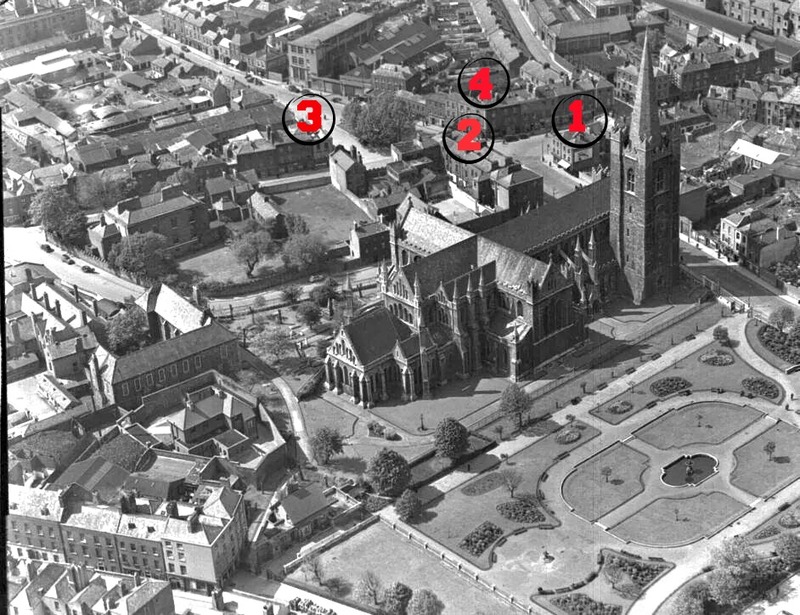 Brilliant article with lots of interesting info, grew up in the area and have vivid memories of the four corners including the jax which I used on many occasions either on the way home from the Bayno or the Iveagh Swimming Baths, there were a fair few dotted around Dublin and the College Green and Rathmines ones come to mind, always very handy if ye were caught short. I learned of another 4 Corners of Hell in Dublin…..yes it seems we had 2 X 4 corners way back…..the other one being Longford Street….Ship Street….Stephen’s Street and Golden Lane. Perhaps you could add that project to your itinerary. Once again many thanks for a wonderful blog. Great article. I’m not a Dub and certainly not old enough to remember any of these pubs. An old closed pub I pass from time to time is The Tenters just down the road from this area. Does anyone have any information on this? Looks like it might have been a great pub in its time!